Not everyone has the luxury of having an extra bathroom, but if you do, why not go all out on your next bathroom makeover? This is your chance to unleash your creative side, so go full force and create a stunning and truly one-of-a-kind space for your guests and visitors. Having a spare bathroom gives you the opportunity to step out of your comfort zone. Are you more of a neutral kind of person? This could be your chance to explore other color options, and you never know, you might just fall in love with a new shade! A spare room also allows you the chance to explore other style aesthetics that you might be hesitant with - just be sure that it will still have an element that can tie in with the rest of your home. 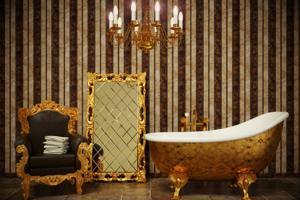 If you're more into the contemporary setting, be adventurous and opt for an antique bathroom vanity instead. The contrast will create a stunning focal point in the room.